RWJBarnabas Health (no affiliation with the Robert Wood Johnson Foundation) is New Jersey’s largest health care system, providing treatment and services to more than 5 million residents each year. In 2017, RWJBarnabas launched a new effort to tackle underlying factors that can make it more difficult for some to be healthy. These include poor housing, unsafe streets and lack of affordable, nutritious foods. The Social Impact and Community Investment (SICI) practice works closely with local organizations and residents to understand their needs and vision for a healthier future. Led by Michellene Davis, executive vice president and chief corporate affairs officer at RWJBarnabas, the SICI practice truly puts health equity at the forefront. The SICI practice conducted a community needs assessment that identified food insecurity as a driver of health inequities in Newark. In the city’s South Ward alone, more than 5,000 residents receive benefits from the federal Supplemental Nutrition Assistance Program (SNAP), commonly known as food stamps. Watch A Blueprint for Changemakers video. Working with local partners, the SICI practice held convenings throughout the city’s five wards. Those events sparked discussions that informed strategies for changing the city’s policies and systems to help more low-income residents access affordable, healthy food. Together with the Greater Newark Community Advisory Board, area nonprofits, hospitals and other local organizations, the SICI practice has helped to accelerate changes that are creating a thriving food system in Newark—including urban agriculture plots, farmers’ markets, and community gardens. The practice is also working to streamline access to SNAP, WIC and other important programs that support low-income residents. Davis believes these accomplishments are just the beginning of their work to proactively make their community healthier. She adds, “We’re looking to serve as a model for other communities with similar issues. There are more examples like Newark—places where leaders, universities, hospitals, businesses, churches, and philanthropies are working together to create opportunities so all residents have healthier choices. Newark is one of eight communities that partnered with ChangeLab Solutions to reshape the city’s laws and policies. ChangeLab Solutions provides technical assistance—funded by RWJF—to help state and local leaders use policy change to improve health for all residents. For more than 20 years, the ChangeLab team has been working alongside communities to help them create lasting changes that will help all residents live a healthy life. We know many places are working to achieve equitable outcomes but are struggling with how to do it. A new resource, A Blueprint for Changemakers (Blueprint), is the how-to guide that answers this question. It is grounded in our work to help residents and policymakers develop and advance home-grown solutions that reflect their lived experiences and is designed to create healthy, equitable communities. It is a guide to educate decision-makers, practitioners, and communities about legal and policy strategies that benefit children, their families, and the communities where they live. It is a gamechanger for all of us who are working to advance health equity. The Blueprint explains the fundamental drivers of inequity—structural racism; income inequality; poverty; disparities in opportunity and power; governance that limits meaningful participation—and provides strategies for addressing each of them. All of the strategies in the Blueprint are grounded in four guiding principles that can help inform new laws and policies intended to spur equitable outcomes. Actively involve those who will be most affected by the laws and policies you are working to change. This means ensuring that residents understand potential trade-offs and indirect consequences of policy decisions and have a say in what happens. Community convenings and other efforts that encourage regular dialogues and meaningful participation can help to build trust between policymakers and residents. This is a win-win that affords residents more control over their environment and allows decision-makers to gain support for policy changes. Assess your community’s needs first. Do you need to build more awareness or do you already have the political will needed to take action? As you’re identifying partners and developing leaders, consider a broad range of stakeholders that represent the community. With more organizations and resources at the table, you’re more likely to reform policies and achieve your health equity goals. In order to develop a shared vision and plan for a healthier, more equitable community, take steps to understand local problems and the systemic issues that are causing them. Ask questions about where and how health issues originated. Use data to describe inequities and map disparities. Work with partners to determine whether the disparities are based on race, socioeconomic status, or other factors. Work together with your partners to map out the systems and conditions that contribute to those disparities and prioritize targets for collective action. Strategically aligning your work across sectors helps prevent resources from spreading too thin; pools capital for priority actions; and ensures that the issues you’ve identified are addressed from as many directions as possible. We believe law and policy can be one of the most effective paths forward to a healthier, more equitable America. And you don’t have to be a lawyer or an elected official to use law and policy as a tool. A Blueprint for Changemakers is a guide for all of us. Use it to start conversations. Use it to build partnerships. Use it to transform your community into a place where everyone has the opportunity to make healthy choices. 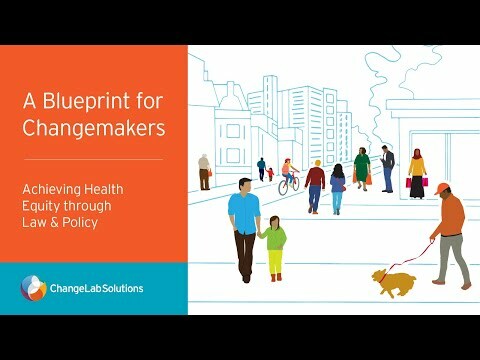 Learn more about how you can start promoting health equity in your community with A Blueprint for Changemakers. Monica Hobbs Vinluan joind RWJF in 2015 as a senior program officer, and has been a passionate professional advocate for health promotion and a distinguished government relations professional on a variety of health and well-being issues for two decades. Shauneequa Owusu is senior vice president of innovation and impact at ChangeLab Solutions, where she works at the intersection of community development and health.